Born in Allentown, Pennsylvania, Father Oleksa has spent the last 40 years in Alaska, serving as village priest, university professor, consultant on intercultural relations and communications, and authoring several books on Alaska Native cultures and history. A 1969 graduate of Georgetown University and of St. Vladimir’s Orthodox Theological Seminary, he completed his doctoral degree in Presov, Slovakia, in 1988, with an emphasis in Native Alaskan History during the Alaska Russian period (1741-1867). Recognized as an "Elder" by the Alaska Federation of Natives, a Distinguished Public Servant by the Board of Regents of the University of Alaska, and honored by the Alaska State Legislature and the National Governors Association, Father Michael is a storyteller who seeks to foster greater understanding across boundaries of race and culture. He is a leader in the development of cross-cultural education in Alaska, an educator of Alaskan teachers, and a student of Alaska Native languages and cultures. His four-part PBS television series, Communicating Across Cultures, has been widely acclaimed. 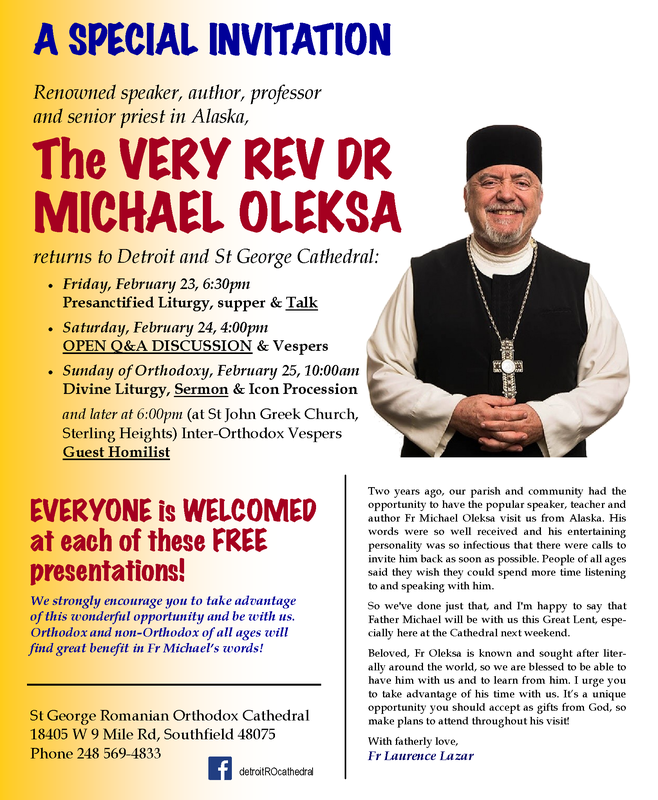 While in the Detroit area, Father Oleksa will also be hosted by St. George Romanian Orthodox Cathedral, 18405 W. Nine Mile Rd. 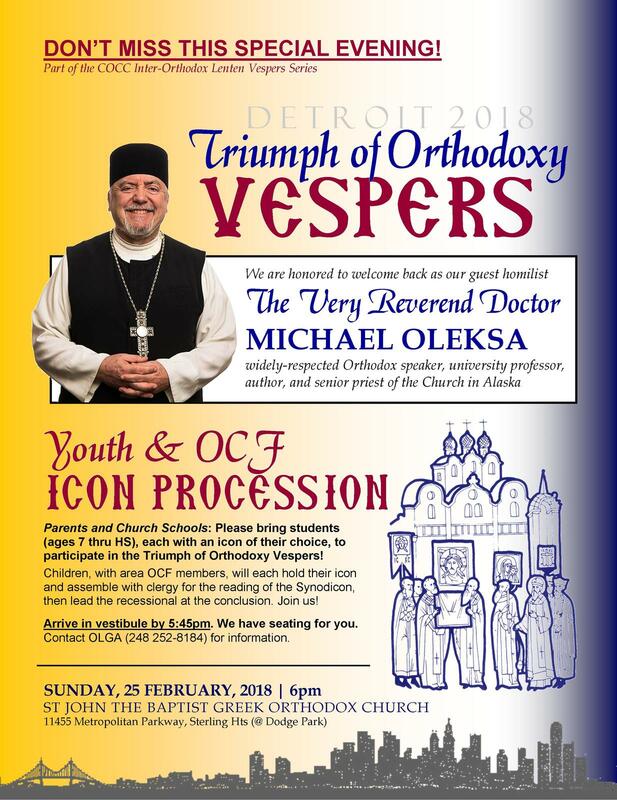 in Southfield, where he will offer a short talk following their Presanctified Liturgy & Supper beginning at 6:30 p.m. on Friday, February 23, and lead an “Open Q&A Discussion” on Saturday, February 24 beginning at 4 p.m., followed immediately by a Vespers service at 6 p.m.
Members of the public are invited to attend the services and presentations. For further information, visit www.coccdetroit.org or contact COCC president Olga Liskiwskyi (248 252-8184) or the St. George Cathedral office (248 569-4833).